"This is the real deal that is found in the heart of Florida. 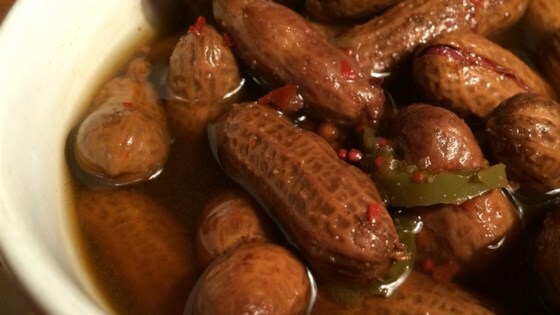 I made this recipe to resemble the taste of my favorite boiled peanuts found in the Ocala National Forest. My family agreed this recipe was one of the best!" Place peanuts, crab boil, jalapenos, garlic powder, salt, Cajun seasoning, and red pepper flakes into a slow cooker. Pour in water to cover the peanuts and stir to combine. Cover and cook on Low until peanuts are soft, at least 24 hours. Stir occasionally, and add water as needed to keep peanuts covered. Drain; serve hot or cold. Great flavor except it is WAYYYYYY too salty. I would cut back the salt to a few tablespoons.